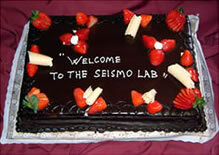 The Seismo Lab Social is an event looked forward to each term. This is a time when faculty, visitors, grad students, post-docs and staff join together to socialize in a casual setting. New arrivals are introduced and welcomed, while our departing friends are bid a fond farewell. The relaxed atmosphere provides a place for all to become acquainted with one another professionally and personally. As with any good social, refreshments and a great time are shared by all. 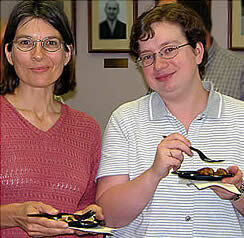 Professors Joann Stock and Nadia Lapusta.